At one time San Francisco was ringed with elevated expressways. After the 1989 Loma Prieta earthquake the ones blocking the best views of the Bay (and had some earthquake damage) were removed. One of the remaining freeways was the Southern Viaduct that carries SR-280 from the Bay Bridge to SR-101. This was one of the few repairs/retrofits designed to keep the bridge in service after a very large earthquake. Basically, they supported the bridge deck on shoring and replaced the foundations, columns, and bent caps. 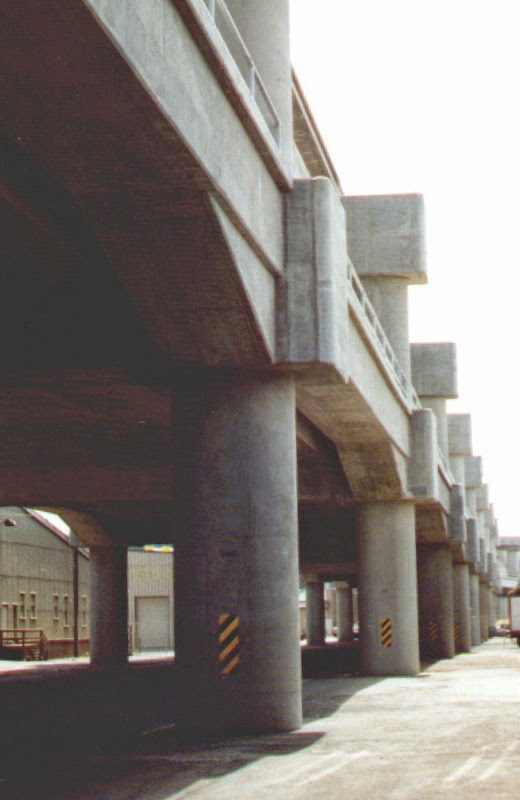 The retrofit included strong 'edge girders' to capacity-protect the superstructure and force plastic hinging in the ductile columns. It's a double-deck expressway with the top outrigger bent caps pinned because Caltrans wasn't sure (right after the earthquake) how to design the knee joints for the large opening and closing moments of fixed connections.